The high cost of child care is a major stumbling block for parents of young children. In the greater Seattle area, it costs $17,472 annually for infant care and $15,288 for toddlers, which is more that undergraduate in-state tuition at the University of Washington. 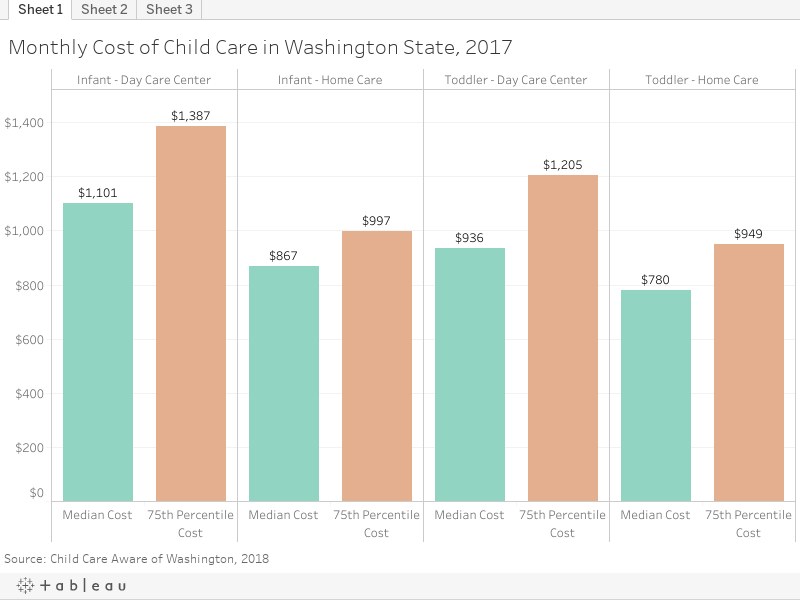 Even in less expensive markets, such as Yakima, it’s as much as $8,728 for infant care and $7,128 for toddler care. The child care industry not only nurtures our young children, but also provides a firm basis for a stable workforce and a necessary service for families. Yet in 2016, Washington’s child care teachers made less money than pet groomers. Furthermore, Early Childhood degrees have the lowest projected earnings of all college graduates. This is a national problem. In 2017, Senator Patty Murray introduced The Child Care for Working Families Act which demands increased compensation for the workforce, and addresses affordability and access to quality child care for families. But, we can’t wait for the federal government. State and local lawmakers need to ease the crunch by investing more into compensation for early childhood educators. According to the Bureau of Labor Statistics, there are 9,080 Early Childhood Educators in our state, and the mean annual wage is $27,800. Early learning providers in Washington are in crisis. Low compensation directly impacts the hiring and retention of staff, which negatively affects programming quality and the ability for centers to stay in business. According to a statewide survey the Economic Opportunity Institute conducted in 2018, 98 percent of center directors expressed concern for their ability to hire qualified staff and 68 percent feel the quality of the programs are compromised because of staff shortages (this data will be available August 2018). In the race to create quality programming for children, our state forgot to invest in the life-force of this system: early childhood educators. In 2015, the Legislature passed the Early Start Act (ESA) to expand high quality early learning. ESA sustained Early Achievers, Washington’s quality rating and improvement system, which holds providers accountable to their commitment to providing high-quality care. But, little has been done to address the systemic problems created by low wages, high turnover, and other factors influencing the supply and retention of early childhood educators. Early childhood education teachers who live in poverty are more likely to experience toxic stress, depression, and chronic health issues, contributing to their own economic insecurity and actual poverty while jeopardizing their ability to provide enriching and nurturing environments for children. According to data collected in 2018 by EOI, these factors are also driving early childhood education workers out of the field and into other industries with higher wages and health benefits (this data will be available August 2018). Investing in high quality early childhood education has proven to be a great investment. For every $100 Washington spends on high quality early childhood education, our economy receives $113 in return. However, that return on investment is only achieved when the care is high quality. Our state has forecasted 3.9 percent annual employment opportunity growth for early childhood education teachers, with 3,270 positions open year. Additionally, over one-third of the workforce is turning over. To enable every child a pathway to well-being and educational advancement, we must recruit and retain and appropriately compensate an educated and esteemed workforce. To learn more about what early childhood educators do on a daily basis for our children, click here. To learn more about EOI’s research on early learning and what you can do to support increased compensation for early childhood educators and affordability for families, please contact Sarah Clark at sarah@eoionline.org.